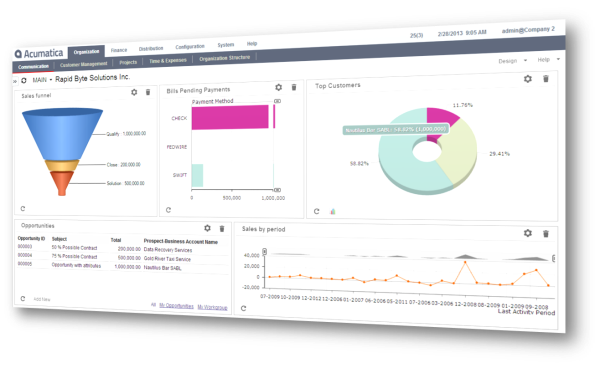 The Acumatica Distribution Management Suite is an add-on module to the Financial Management Suite for managing the complexities of distribution such as purchasing, ordering, tracking inventory, filling orders, and delivering customer support. Access 100% of the distribution features from anywhere using any popular web-browser. Gain real-time visibility into inventory costs and locations across multiple warehouses. Automated sales order processing and shipping order generation ensures rapid delivery. Security controls allow up-to-date status information for all employees and partners. Access past information and receive insights into future needs with drill down reports and dashboards. Optimize purchasing by maintaining a vendor supply list. Maintain supplier and customer balances in two currencies. Currency translations are performed automatically. Improve customer service and profitability with real-time access to available inventory, inventory in transit, and inventory costs. Centrally manage sales activities: entering quotes, fulfilling sales orders, creating shipments, tracking prices, applying discounts, checking available inventory. Automate the way you gather requests, obtain vendor bids, create quotes, approve quotes, manage purchases, and fulfill orders for internal or external clients. We would love to speak with you about how the Distribtuion Management Suite for Acumatica Cloud ERP, partnered with Klear Systems, Inc., can benefit your organization.